Vodafone dhamaka offer yoyo and gogo grab this offer and Vodafone has introduced three new prepaid plans which offer 1.5GB of data per day, including voice calls and SMS benefits. 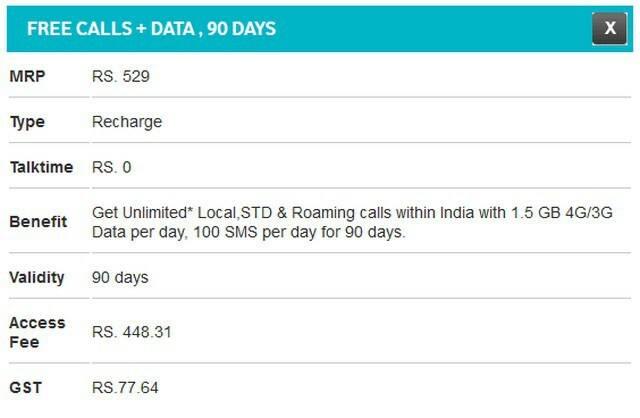 Vodafone’s new prepaid plans are priced at Rs. 209, Rs. 479 and Rs. 529, and take on similarly priced prepaid plans from Jio which also offer 1.5GB of daily data. The new Vodafone plans are only available in a select few states I guess circles across the country, however, they are expected to become available in all cities or states soon. The Rs. 529 plan offers 1.5GB of 4G/3G data per day as well as unlimited local or STD calls and 100 SMS per day with a validity of 90 days. However, the unlimited calling facility is limited to 100 unique contacts throughout the validity period, with calls limited to 250 minutes per day and a maximum of 1,000 minutes in a week. The Rs. 529 prepaid plan offers nearly the same benefit as the Rs. 509 plan, except that the daily data allowance for the lower priced plan is 1.4GB per day. The Rs. 479 prepaid plan offers the same benefits as the Rs. 529 plan which includes 1.5GB of data per day as well as unlimited local or STD calls and 100 SMS per day. The Rs. 479 plan comes with a validity of 84 days and is priced close to the Rs. 448 plan which offers similar benefits but with a lower data allowance of 1.4GB per day. The new Rs. 209 prepaid plan has a validity of 28 days and offers benefits such as 1.5GB of data per day, unlimited local or STD calls and 100 SMS per day. The Rs. 209 plan supersedes the Rs. 199 plan which offers 1.4GB of data per day, alongside similar calling and SMS benefits. You can check the availability of the new Vodafone prepaid plans on Vodafone’s official website and the MyVodafone app.